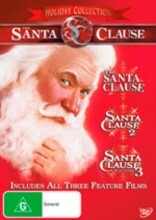 The Santa Clause DVD Box Set includes all 3 Santa Clause movies starring Tim Allen. When Santa Claus gets killed in a freak accident after being startled on the rooftop of a house, it looks like Christmas is ruined. But fortunately, just before his death, the jolly, gift-giver passed the torch to ad executive Scott Calvin (Tim Allen), who finishes the job of bestowing holiday cheer on all. When he finally reaches on the North Pole, however, Scott learns that he can't give up the job -- he's become the next Santa Claus. (THAT'S the Santa Clause!). Scott returns home, only to find himself slowly changing into the pudgy, white-haired old man so beloved of children... and to find that everyone around him considers him utterly and completely mad. Scott Calvin (Tim Allen) found a jacket eight years ago that turned him into Santa Claus. Unfortunately, 900-year old elf Curtis (Spencer Breslin) failed to read the fine print in the Santa Clause and didn't notice that Santa has to find a wife or stop being Santa. As Christmas Eve--the marriage deadline--approaches, Santa finds himself slowly returning to his mortal appearance as the "de-Santification process" begins. Holiday magic mixes with comical chaos at the North Pole in The Santa Clause 3: The Escape Clause. Tim Allen reprises his role of Scott Calvin, aka Santa, as he juggles a full house of family and the mischievous Jack Frost (Martin Short), who is trying to take over the big guy’s holiday. Click the button below to add the SANTA CLAUSE 1, 2 AND 3 to your wish list.